Red, white and black are great colors on little girls. The black with white polka dot shirt is adorable with the bottom half of the shirt being a red corduroy. 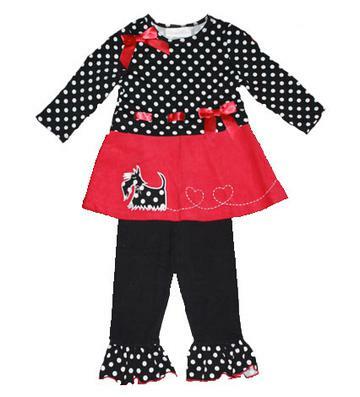 There is a red bow around the waist and on the right chest and a applique scottie dog on the bottom hem. There is matching black leggings with black and white polka dot ruffles on the bottom. This super soft and adorable outfit is 95% cotton and 5% spandex.